If you’re looking into teeth straightening options for yourself or a loved one, odds are you’ve heard of Invisalign. This relatively new piece of dental technology is revolutionizing orthodontics, as fewer teens and adults are having to deal with braces and rubber bands. Now, you can get that beautiful, straight smile you’ve always dreamed of without metal brackets, and it’s all thanks to Invisalign retainers. Contact our team at Constitution Dental in Downtown Ottawa to book an Invisalign consultation or to inquire about the cost of Invisalign with your dental insurance plan. In a previous blog post, we discussed some reasons why dental patients love Invisalign, including the fact that these “clear braces” are far more comfortable than traditional braces and that the treatment takes less time to complete. Rather than being fixed to the teeth, these “invisible” braces are in the form of removable retainers, which your dentist customizes to fit your unique treatment plan. Here’s how it works! As with any other orthodontic treatment, we begin our Invisalign treatments with an initial consultation, where we determine whether you would be a good candidate for this teeth straightening method. Invisalign retainers can fix a number of different issues surrounding misaligned teeth, including overbites, underbites, crossbites, open bites, gapped teeth, crowded teeth, and crooked teeth. This means that lots of dental patients can benefit from Invisalign treatment, and that your dentist can create a custom treatment plan that addresses your unique needs. 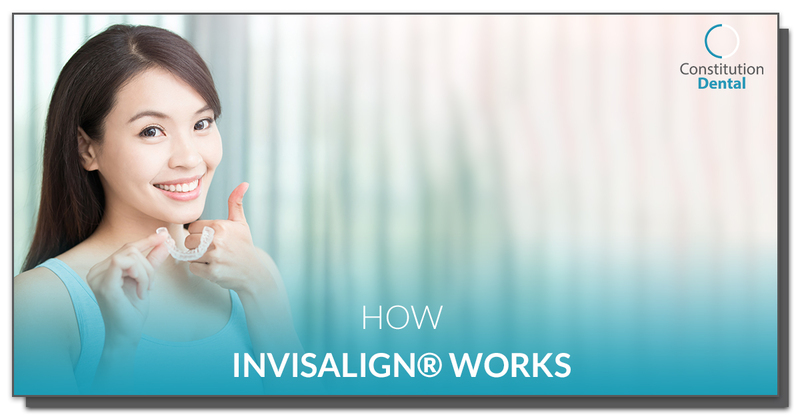 Once your family dentist has determined what Invisalign can do for you, they will take a digital scan of your mouth in order to create your customized set of Invisalign retainers. Then, they will order these trays for you, which you will pick up at your local dental clinic. The great thing about invisalign retainers is that you’re never alone in the treatment — you’ll pick up your new set of retainers every few weeks and check in with your dentist as you make your way through each aligner set. Essentially, this is the “map” that you will follow as you switch out each retainer, resulting in straight teeth after just 15 weeks. Invisalign is like many other things in the sense that it takes discipline, effort, and consistency, and that what you put into the treatment is what you’ll get out of it. Each set of Invisalign retainers are meant to be worn all day every day for two weeks, though they are removable for eating, drinking, brushing, and flossing your teeth. For best results, be sure to wear your Invisalign trays at least 22 hours per day, not just overnight. When worn diligently, you’ll be on the fast track to finishing your teeth straightening treatment in just over a year! Once you have reached the end of your Invisalign treatment, meaning that you have worn the final retainer for two weeks, it’s time to visit your local dental office for a follow-up with your dentist. During this visit, they will examine your teeth and your bite while comparing it to the digital roadmap when treatment first started. If your teeth are in perfect alignment and you are exhibiting the correct bite, your treatment is over! To maintain straight teeth, you’ll receive a set of aligner trays to wear at night going forward. At Constitution Dental, we believe that a beautiful smile has many benefits, both physically and mentally. If you are ready to straighten your teeth and regain confidence in your smile and overall appearance, it’s time to consider Invisalign. Contact us today to book an Invisalign consultation in Downtown Ottawa!